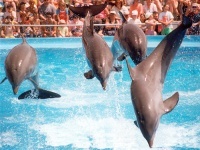 A must for families travelling in Mallorca with children is a trip to Marineland, where kids can enjoy watching the dolphin and sea lion shows. Marineland also has other attractions including Europe's largest collection of sharks, a parrot circus, aquariums, crocodiles and snakes. For a fee, visitors can choose to touch and have photographs taken with the dolphins and other animals after their shows. Children of all ages will love discovering all the animals and watching the spectacular shows. There is a wide range of options for refreshments in Marineland, with restaurants and pizzerias serving up simple food. It is also possible to take your own picnic. There is a gift shop well stocked with potential souvenirs. If watching all the animals cavort in the water makes you jealous, Marineland offers direct access to one of Costa de Calvia's loveliest beaches, where you can end your day with a swim, or lounge in the sun between shows. There are discounts for booking online and booking in advance allows you to skip queues at the entrance. For details on the times that the various animals perform and feeding times check the official website listed below. Opening times: Open daily from 9.30am to 5.30pm. Admission: €24 (adults); €16.50 (children aged 5 - 10); €8 (children aged 3 - 4).